DAVIS--Sean Duffey died suddenly in Davis, California, on May 21, 1997, from an embolism precipitated by unsuspected, aggressive, and difficult to diagnose lung cancer. To the last he was unaware that he was ill and was vigorous and active up to the moment of his death. Sean is survived by his wife, Anne; his sons, Brendan and Seth, of Davis; and his parents, Betty and Laurance Duffey of Calgary, Alberta. He was born November 28, 1943, in Toronto and received his bachelor's and master's degrees in zoology and his Ph.D. in botany from the University of British Columbia in Vancouver, the latter in 1974. Following receipt of his doctorate, he spent two years on a NATO/National Research Council of Canada Postdoctoral Fellowship at the University of Georgia. 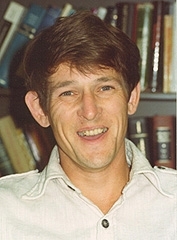 He joined the faculty of the Entomology Department at the University of California, Davis, in 1976. Sean's research program focused on chemical ecology and his efforts ranged widely over the interactions involving chemicals, plants, and insects. His first studies were of the cardiac glycosides produced by milkweeds (Asclepiadaceae) and their sequestration by the insects that fed on them. His primary efforts concentrated on the milkweed bugs, Oncopeltus fasciatus and Lygaeus kalmii, but he also worked with monarch butterflies and milkweed beetles. Among his important discoveries was the fact that a biophysical system was operating in the sequestering of cardiac glycosides. While continuing his research on cardiac glycosides, Sean began an analysis of the remarkable cyanogenic defensive secretions of Polydesmid millipedes. There followed several papers on the biochemistry of HCN production and the production of other defensive compounds in these interesting animals. After arriving at UC Davis, Sean began a long series of brilliant studies on the chemical mechanisms used by plants to fend off attack by insects and various pathogens. This work centered on resistance in tomatoes, and over the years he collaborated with numerous students and colleagues. Studies analyzed the role of numerous chemicals produced by plants including tomatine, proteinase inhibitors, and various plant oxidative enzymes. Recent studies had included analyses of induced defenses and the interactions of chemicals with the biological agents such as parasitoids and baculoviruses used in various IPM and biological control programs. A constant theme and frequently emphasized message in Sean's work was the fact that chemical-biological interactions were rarely simple and straightforward. He stressed that in order to understand plant-insect interactions, for example, it was necessary to understand the interactions among plant chemicals, the overall characteristics of the insect's diet, the physiological state of the insect, and the modifiable characteristics of plant and insect. Chemical and biological context and chemical mixture were seen as critical determinants of biological activity; a simple view that natural products functioned merely as "toxins" or isolated defensive factors was often misleading. His was truly interdisciplinary research that included several joint projects with members of the Entomology Department and also with colleagues in the departments of Nematology Ecology and Plant Pathology. We all experienced Sean insisting over and over that interactions are not simple and that one must understand the chemistry, the physiology, and the ecology to really understand interactions between plants, insects, and their pathogens. Sean's legacy is an outstanding record of how to go about studying plant-insect interactions, not just the gathering of data on interactions that occur. Teaching was always a priority and a passion for Sean, and he was the antithesis of the much caricatured professor ensconced in an Ivory Tower interested only in research. He taught in some 20 different courses ranging from general education courses aimed at introducing students in the arts and humanities to the wonders of insects to advanced courses for the most sophisticated of graduate students. In these latter courses, the length and breadth of the reading lists were legendary and reflected Sean's incredible range of interest and understanding of insect-plant interactions from the ecology of the insects to the arcana of the most subtle of chemical and physiological reactions. His courses were characterized by constant prodding from Sean to get students to think, to question, and to analyze. He was fiercely analytical himself, and he cajoled, coaxed, and occasionally harassed students to be likewise. He had an uncanny ability to see the potential in each student and to encourage each to do his or her best. Sean was always extremely popular with students and his passion for good mentoring matched that for his teaching. He served as Master Graduate Advisor for the department and chaired its Graduate Policy Committee. His lab was a busy place with undergraduates, graduate students, and postdocs from both his and other laboratories carrying out projects. Always approachable, Sean not only advised and directed his own students, but was inspiration and help to several others from fields as diverse as Toxicology and Anthropology. Sean's professional activities included membership in several societies and positions on the Editorial Boards of leading journals in his field such as the Journal of Chemical Ecology and Physiological Entomology. He was active in disseminating his research, presenting important invited papers at the International Congresses of Entomology and the Gordon Conferences. He also enthusiastically encouraged his students to present their work, and the later successful careers of many of them reflect this early encouragement. Sean was also fully committed to participating in the governance of the University and chaired or served on many important committees in the College of Agricultural and Environmental Sciences and in the Academic Senate. He was vice chairperson of the Department of Entomology at the time of his death and was the acting chairperson in 1994-95. Sean recognized that a department and a university were not simply the sum of faculty, grants, papers, committees, and courses. Rather he knew that they must be, in the largest sense, an integration of everyone from the lowliest of beginning students, to office staffs, to graduates, to postdocs, to technicians, and to faculty He saw us as part of a larger community, and his words and deeds affirmed this. It would be hard to imagine anyone more committed to his science, to his teaching, to his department, and to his university. It is one of the wonders of Sean's life that he was equally committed to family and friends. Never one to let grass grow, Sean actively pursued outside interests in his "spare time." He was a dedicated runner, putting in several miles most noontimes. He had an intense interest in good music, and the strains of Bach, Mozart and other masters nearly always emanated from his office. He read widely, often startling colleagues with his depth of understanding of seemingly arcane subjects. When his sons started playing soccer, he immersed himself enthusiastically in the local program, refereeing games and serving as head referee for several years. His garden was a riot of blooming plants, several carefully chosen to attract butterflies and other insects. The number of lives that Sean touched was remarkably revealed at his memorial service where hundreds of mourners overwhelmed the capacity of the church and flowed around the alter, clogged the aisles, and spilled out onto the lawn outside. Sean will be intensely missed by those of us who were his colleagues. His maturity, wisdom, and intense loyalty will be hard to replace, but his laughter and personal warmth have left a glow. He touched lives in many ways from his flourishing bow as he ushered a member of the office staff through a door to his cheerful greetings in the morning and hearty wave when he left for home. He made our department a better place; he made UCD a better campus; he made Davis a better community. And he also made many of us better persons. There will be two memorials to Sean in the department that will go some small way toward expressing our regard for him. The first is a Graduate Fellowship in Chemical Ecology bearing his name, and the second is a sculpture by local artist Donna Billick to be placed at the entrance to the department.